Build the barn before you paint it. For those not familiar with the breed, they are the original American fowl having evolved from the mongrel stock of the distant past. By the early 1800s they were recognized as a breed – well in advance of the Asiatic breeds arriving on this continent. Some find the cuckoo pattern of the Dominique a trifle boring. On the other hand, any who have had the pleasure of seeing good specimens can appreciate the erratic pattern of the Dominique’s barring. One particular trait that is lost in many of the modern strains is the “eye” that is to be seen at the end of each feather. The shape of the bars and the rounded end of the feather causes this. One could almost call the final bar – “lacing”. If you are unsure of this pattern, look closely at A.O. Schilling’s artwork in the black and white Standard of Perfection. The color of the Dominique is elusive. The modern view is light bars just short of white and dark bars just short of positive black. To me this is Barred Plymouth Rock barring. I hold to the descriptions used in the writings of the 1800s. The light bars should be silver white and the dark bars should be dove-gray. This combination gives the Dominique a blue appearance. Interestingly enough, the dove-gray color is found only on those birds carrying the “eye” in their feathers. Type in Dominiques is easier to show on a bird than it is to describe. The Dominique is very similar in shape to a Hamburg, though slightly heavier. Rather than try to describe it, I refer the reader to A.O. Schilling’s artwork and the Standard of Perfection. No other artwork of Dominiques comes as close to the Standard description as does Mr. Schillings. The comb of the Dominique is one of the more hotly debated topics. Some like a large coarse come, some like a very refined smooth comb and others like anything in-between. The old Henderson line produces a male with a textured bumpy surface free from voids. This produces females as seen in the Schilling artwork. Through the years I have noticed a very specific type of male comb is needed to produce a female with a good lift to her spike. The male should have a comb that begins low in front, arcing upwards slightly, then at the back of the head, the comb should go slightly back down before the spike begins an upwards sweep. This is the classic “rose” shape that is needed. It looks somewhat like a rosebud laid on its side. Very rarely do you see these males in the show room. For those of you in the colder climates the rose comb of the Dominique is desirable as frostbite is rare. During extreme cold or when in a draft, the spike on the males’ comb occasionally freezes and though this may end his show career, it does no long term injury to the bird’s health. The Dominique’s mothering ability is legendary. 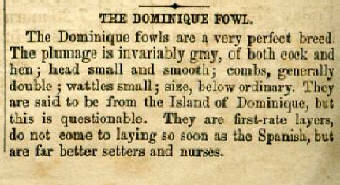 In fact most of the early poultry articles refer to using Dominiques as broody hens. At the left of this page is copy from an 1852 issue of The Poultry Breeders Almanac from a Pennsylvania poultry supplier. While the breed is generally a good fowl for setting eggs, there are the occasional exceptions. The best Dominique hen I ever owned was an extremely inept mother. She broke eggs in the nest, she trampled little chicks and periodically left them to their own devices while she went foraging. However, on the whole, the Dominiques are very good broody hens. I have found that it is best to wait until they are a year old before letting them go broody. Young pullets sometimes abandon the nest during the final stages of incubation. An old Dominique hen can be a ferocious beast when setting. More than once I’ve had them draw blood on my hands when trying to capture the little tykes for toe punching. Egg size in the Dominiques has diminished as the flocks have become severely inbred. The Voters were diligent at increasing egg-size and flocks based on their work continue to produce a reasonably uniform medium to large egg. The loss of egg size must be remedied in all flocks as this portends future problems. The final trait associated with the Dominiques is it’s foraging ability. I’m not sure of the situation in Canada, but in the U.S. there are fewer and fewer flocks being allowed free access to the barn lot. The Dominique does extremely well foraging for bugs, weed seeds and the like. In fact I look forward to young birds going out, as there is a noticeable decrease in the feed bill and a noticeable increase in the health and vitality of the birds. However, if allowed to roam, take the proper precautions. In 2001 the neighbor’s German Shepard jumped the 5-foot fence to get in the brooder yards. In one afternoon he destroyed all except 14 of my young birds. Since then we are using an electric fencer normally reserved for use with stud horses and bulls. So far, no problem. I encourage you to try a few Dominiques. The Dominique is not for everyone, but those who adopt it find Dominiques to be an easy-to-keep fowl with many merits. I can’t imagine the Fields’ Poultry Yards without them. 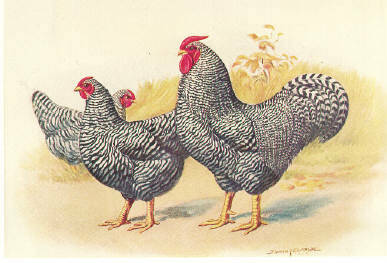 Around 1915 Dr. Harwood maintained a breeder flock of over 500 Dominique hens. In Germany the Dominique is known as the Dominikaner. The Dominique is America’s oldest breed of livestock! The Voters rarely hatched more than 25 chicks in a year. APA judge Brian Decker points out the Dominique is more of a quarter horse than a Clydesdale.